Live view digital SLR cameras let you see a preview of the image you're about to take on the camera's LCD screen. I'll pause for just a moment to let that sink in. The big deal here is that EVERY compact digital camera out there already has a live view LCD. It's the primary reason whey people take photos now holding the camera at arm's length rather than up to their face. But digital SLR cameras aren't built quite the same as the compact models, which is why live view digital SLRs aren't as common. In the paragraphs that follow, I'll talk more about this feature and will identify the current cameras that include it. Digital SLR cameras aren't built the same way as their compact cousins, and for a long time this has prevented them from having live view LCD screens. 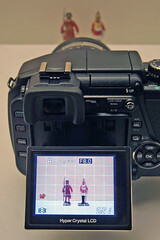 So what's the LCD on a digital SLR used for? It's primary purpose is to display the image that you just took, and to display the detailed menu settings for the camera. If you'd like to learn more about this technology, I've got a whole page that talks about live view LCD screens. In 2006, Olympus released an innovative digital SLR camera called the E-330. The big deal about this camera is that it was the very first live view digital SLR to hit the market. Olympus solved the blocked sensor problem by placing a SECOND sensor in the path of the light being reflected up to the viewfinder. The second sensor transmits a preview to the camera's LCD, and the viewfinder works just like it does on any other digital SLR. Today, there are many other cameras that include a live view LCD. The latest offering in the Rebel line is a bit of a departure from the Rebels of old - it no longer uses Compact Flash memory cards. Instead, the XSi has made the switch to the smaller and lighter SD memory cards. The standard kit lens offered with the Rebel XSi is the EF-S 18-55mm f/3.5-5.6 Image Stabilized lens: this means that the XSi has all of the top three features currently available in digital SLRs: dust control, live view and image stabilization. The Canon 40D is the fastest consumer digital SLR you can buy. It's able to take 6.5 photos per second up to a maximum of 75 JPG images or 17 RAW. In addition to this blazing fast speed, the camera includes a completely updated 9-point autofocus, a fast image processor (to transfer photos to the memory card), Canon's dust control, and the addition of a live view mode on the camera's large 3 inch LCD screen. With a rugged frame and weather-resistant seals and gaskets, the 40D is designed for aggressive use. If you're looking for ridiculous speed in a digital SLR camera, then look no further - the Nikon D300 is the camera for you! With its standard EN-EL3e battery the camera zips along at 6 photos per second up to a maximum of 100. If you add the optional MB-D10 battery grip, that speed increases up to 8 photos per second. This speed is paired with a new dust control system, a new live view mode, an advanced autofocus and metering system (called Scene Recognition), enhanced dynamic range (active D-lighting) and weather resistant seals. The E-410 packs a lot of punch into its compact frame. Even though it's almost the same size as a compact digital camera, it still includes dust control and a live view LCD screen, making the transition from compact to SLR much easier. Identical to the E-410 in many ways, the E-510 includes one important enhancement: a built-in image stabilizer. The stabilizer will work with any Olympus lens that you attach to the camera, and will help when taking photos of still subjects in low light without flash. The E-3 is the flagship Olympus digital SLR camera, designed with professional photographers in mind. Advanced amateurs with enough pocket change will benefit from the E-3's 5 photo per second shooting speed, dust control system, built-in image stabilization, live view LCD (that flips out from the camera body and rotates), weather sealing and an ultra-fast 11-point autofocus system. New accessories for the E-3 include the HLD-4 battery grip (for longer shooting) and two new flash units (FL-50R and FL-36R) that can be activated wirelessly from the E-3's main flash. The K20D boasts one of the highest megapixel counts of the consumer-level digital SLR cameras. In addition to its dust control and built-in image stabilization, the K20D includes a live view mode (the only Pentax SLR with this feature), expanded dynamic range and an 11 point autofocus system all packaged in a weather a dust-resistant body. Previous digital SLR cameras from Sony did not include a live view LCD screen, but the DSLR-A300 does. In addition, the LCD screen is articulated, and can be pulled out from the camera body for easy viewing when composing photos from high and low angles. The live view mode on the DSLR-A300 allows for full use of the camera's autofocus system and continuous 3 photo per second shooting mode. The DSLR-A350 is a lot like its sibling, the DSLR-A300: it includes a new live view mode (not available on other Sony SLRs), an LCD screen that flips out from the back of the camera, built-in image stabilization, dust control and Sony's dynamic range optimization (DRO) which increases shadow detail to produce more natural-looking images. The big difference between the two cameras is in the megapixels: the A350 has 14.2 while the A300 has 10.2. More Digital SLR News - For Free!